Stumpers are enemies in Captain Toad: Treasure Tracker. 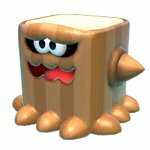 They are brown stump-like enemies with a wooden spike on three sides and a smiling face on the front. Stumpers are always seen appearing in stacks and sometimes even adjacent to each other, moving as a large rectangular prism. They are immune to all attacks. Captain Toad and Toadette take damage from only the sides of this enemy. Traversing across Stumpers is a recurring theme in levels that they appear in. Mokudon From moku (木), meaning "wood"
This page was last edited on March 17, 2019, at 01:32.